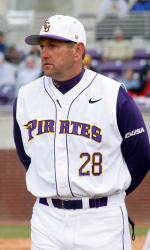 GREENVILLE, N.C. - Thirty-six home games at Lewis Field inside Clark-LeClair Stadium, including the Seventh-Annual Keith LeClair Classic, highlight the 2010 East Carolina baseball schedule announced Wednesday morning by head baseball coach Billy Godwin. The 2010 slate features 17 games against teams that earned a bid to the 2009 NCAA Regionals; 32 against teams with 30-plus wins; five that topped the 40-plus win plateau; two that made trips to the College World Series and five that finished ranked in the Top 25 polls, including three in the Top 10. ECU will open play on Friday, Feb. 19 against College World Series participant Virginia in a three-game tilt and will stay home for their next four games, a midweek match-up against former Colonial Athletic Association foe Old Dominion (Feb. 23) and three games against 2009 Greenville Regional participant South Carolina (Feb. 26-28). Conference USA play opens April 2 for the Pirates when they welcome league foe Tulane to town for a three-game series. Other C-USA schools making the trek to Greenville in 2010 include UAB (Apr. 16-18), Marshall (Apr. 30-May 2) and Houston (May 20-22). League road trips include Memphis (Apr. 9-11), Super Regional participant Rice (Apr. 23-25), College World Series participant Southern Miss (May 7-9) and UCF (May 14-16). ECU’s home non-conference schedule is highlighted by the annual Keith LeClair Classic that pits the Pirates against Illinois (Mar. 5), West Virginia (Mar. 6) and Western Carolina (Mar. 7). Also scheduled for weekend series in Greenville are NCAA Regional participant Monmouth (Mar. 19-21) and North Carolina Central (Mar. 26-28), which serves as the Pirates’ C-USA open weekend. The first of 20 games away from Clark-LeClair Stadium occurs when the Pirates travel to High Point (Mar. 2), which is followed by a west-coast trip to face Cal State Northridge (Mar. 10) and Pepperdine (Mar. 11-13) during their spring break. Along with NCAA Regional participant Elon (Mar. 30 and May 11), ECU will have home-and-home series against UNC Wilmington (Mar. 31 and Apr. 27) and Campbell (Apr. 13 and 20), while also playing High Point (Mar. 23), Gardner Webb (Mar. 16), N.C. State (Apr. 21) and James Madison (May 18). The Pirates, who have made 10 NCAA Regional appearances in the last 11 seasons, claimed the 2009 Conference USA regular season and 2009 Greenville Regional titles before advancing to their third NCAA Super Regional on the way to a 46-20 overall record.